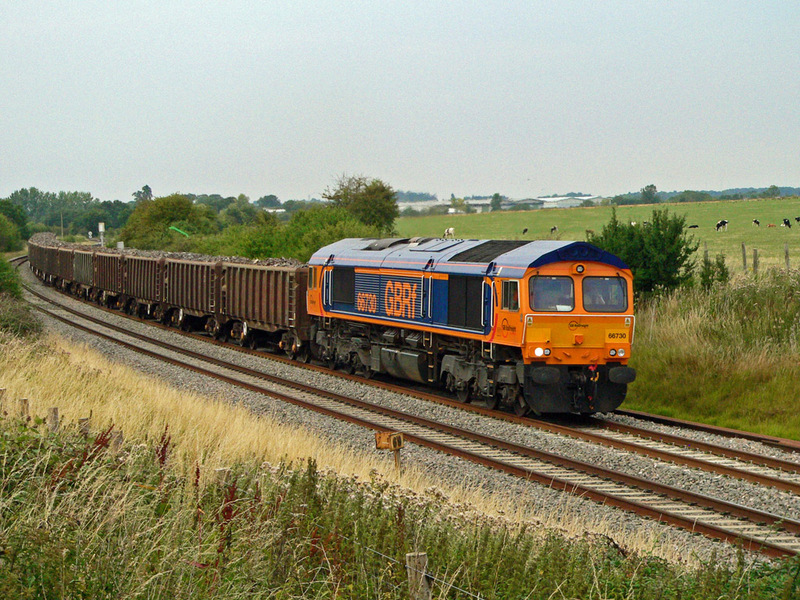 The private train operator English, Welsh & Scottish Railway ordered two hundred and fifty (250) class 66 diesel locomotives from General Motors/EMD (model JT42 CWR). The locomotives were built in Canada and delivered to the UK in batches starting in 1998. This rather poor quality photograph depicts a scene long since vanished into history. In the middle of the picture is class 66 diesel locomotive No.66046 in the exchange sidings at Rover in Longbridge. 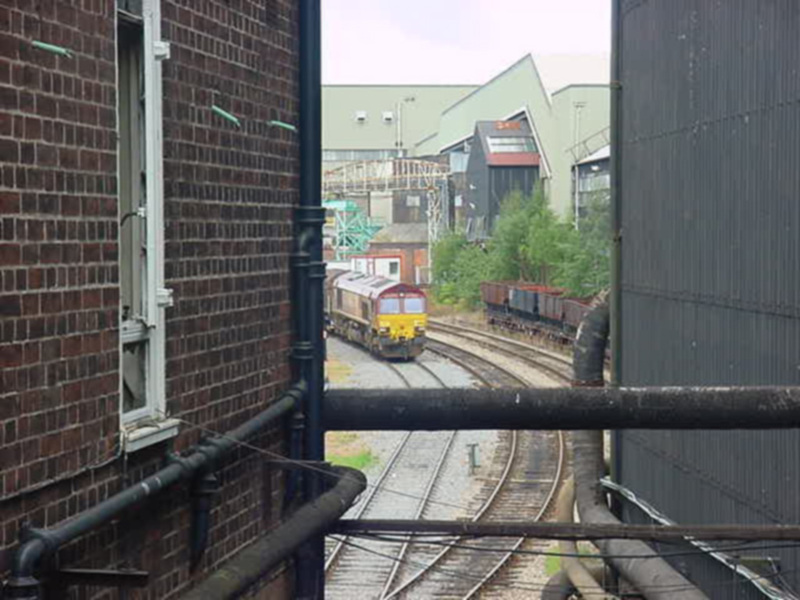 The building on the left hand side is the former BR Longbridge Station Parcels Office which was a listed building and remained in situ in 2011 whist everything else in the photograph was demolished in October 2006, following the closure of the car factory. Class 66 No.66046 is at the head of a Longbridge to Swindon car parts train - the loco would have to run round the train at Kings Norton and return along the main line in the other direction. Photograph taken by Andrew Smith on 3rd September 2001. 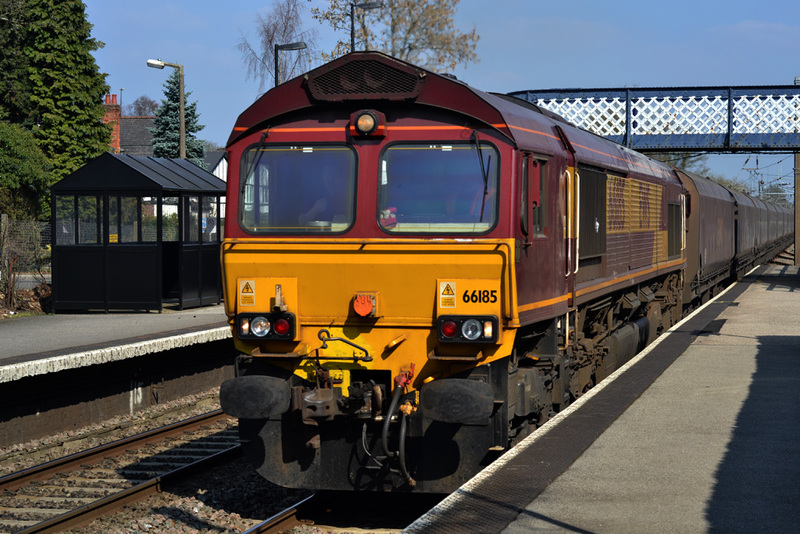 On 23rd March 2011 class 66 diesel locomotive No.66185 speeds through Barnt Green Station with train code No.6V67, 03:53 from Redcar to Margam loaded with coke for the Port Talbot Steelworks. Photograph taken by Andrew Smith. Following delivery of the 250 locomotives for EWS many other visually similar locomotives were delivered and given their own number sequences. One of the later deliveries was No.66403 which was leased to Direct Rail Services but after being returned at the end of the lease was then taken on by GBRf but as can be seen in the photograph above it retained the basic DRS livery. 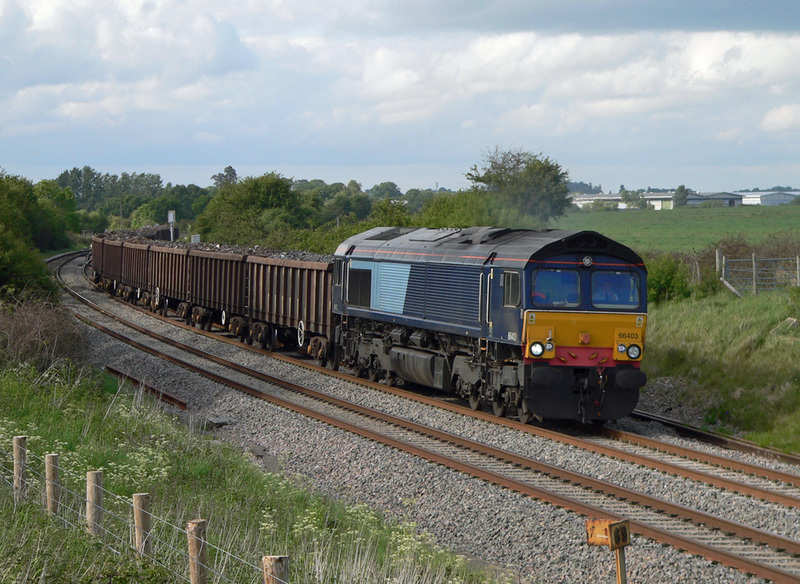 On 20th May 2011 the locomotive was photographed by Robert Cooke at Abbotswood with train No.6Z97 special working of loaded scrap wagons from Beeston to Cardiff Tidal. Having been held at signals at Abbotswood Junction for over fifteen minutes, GBRf livery class 66 diesel locomotive No.66730 pulls slowly away from the junction with a Handsworth to Cardiff Tidal loaded scrap train. Photograph taken by Robert Cooke on 1st August 2011. This photograph demonstrates clearly why politicians should never been allowed anywhere near any organisation that can make decisions that affect the wellbeing of the country. In this case the sheer folly of railway privatisation is summed up by the sight of Freightliner class 66 diesel locomotive No.66586 at Bromsgrove on a Portbury to Rugeley coal train just after it had opened up to gently attack the Lickey Incline. No.66957 is at the rear of the train. What sheer folly and waste of resources that the banker was on the back of the train all the way from Stoke Gifford to Longbridge before returning light engine. Can one imagine what Bromsgrove would have been like in steam days with all the various operators of trains keeping their own banking engines there. They wouldnt be able to line all the bankers up on one line as the operator at the front of the line would not move its loco to release the banker for whichever company’s train was next. There would have to be at least two and possibly more bankers all stabled in their own sidings. Photograph taken by Andrew Lambert on 29th June 2013. 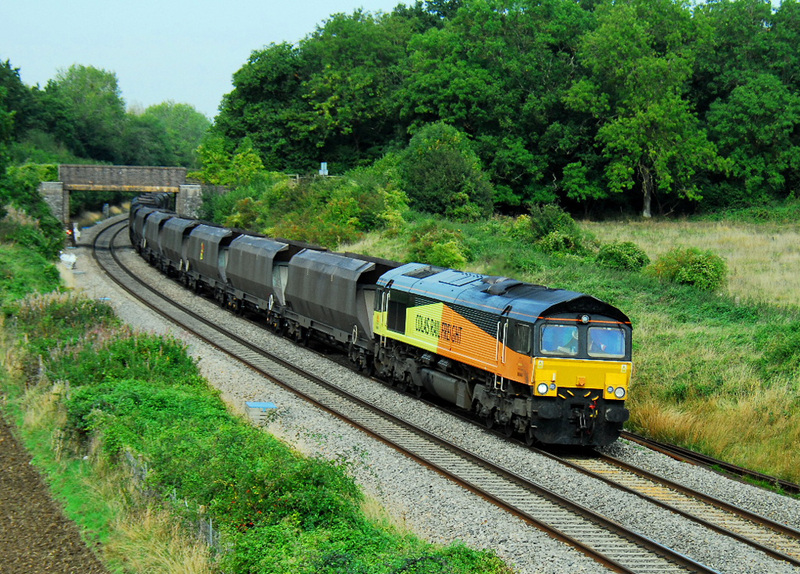 On 27th September 2013 Colas livery No.66848 was in charge of the 08:15 from Ratcliffe Power Station to Portbury. The third wagon in the consist has Colas branding on it. Photograph taken by Steve Widdowson at Croome.